One third of all golfers will sustain an injury that will keep them off the course for 2 weeks or more this season. The most common injuries involve the low back, followed by the elbow, wrist and shoulder. Many injuries are preventable with proper conditioning, good swing technique, and warming up and stretching before playing. Warming up and stretching before a round of golf can reduce injury risk by 50%. The golf swing can put tremendous rotational and extension forces on the lumbar spine, with most amateur swing speeds ranging from 70 to 110 miles per hour. Core strengthening and flexibility are critical to reduce injury risk, and will improve performance. When an injury does occur, and symptoms persist more than a few days, see a physician to make sure you don't have a more serious problem, particularly if you have any pain or numbness into your legs. If you have back problems, changing your swing mechanics to maintain a more neutral spine can keep you on the course with less pain. Injuries to the forearm and elbow often occur as a result of overswinging, pre-releasing the wrists, or hitting shots fat. Conditions such as golfer's elbow (medial epicondylitis) and tennis elbow (lateral epicondylitis) can be prevented by strengthening the wrist flexors and extensors, learning to swing smoothly with a proper release point and weight shift, and getting treatment as soon as symptoms develop. 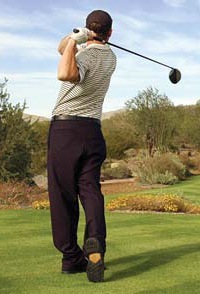 A good golf teaching professional can be invaluable in analyzing and improving your swing. Golf is incredibly challenging, and is as much mental as physical. Visualizing the shot you want to hit, and not focusing on the desired outcome or result, is a technique used successfully by amateur and professionals alike. Approaching the game with realistic expectations and a positive attitude will increase your enjoyment. Walking the course is good exercise, and can burn a surprising number of calories. As the weather heats up, remember to stay hydrated and protect your skin by wearing hats and sun lotion. Have fun out there! Smooth swings with a weighted club; start with half swings, work up to full swings, exaggerating the top of the backswing and finish positions. Stretch the back, shoulders, wrists, hips, and calves. Hit a few balls, starting with half swings using a wedge or short iron, finishing with full swings using a driver (usually the first shot you'll need on the course). Hit your first tee shot down the middle!